A Unified Methodological Framework for Vestibular Schwannoma Research Lukas D. Landegger*1,2,3, Jessica E. Sagers*1,4, Sonam Dilwali1,4, Takeshi Fujita1,2, Mehmet I. Sahin1,2, Konstantina M. Stankovic1,2,4 1Eaton Peabody Laboratories, Department of Otolaryngology, Massachusetts Eye and Ear, 2Department of Otolaryngology, Harvard Medical School, 3Department of Otolaryngology, Vienna General Hospital, Medical University of Vienna, 4Program in Speech and Hearing Bioscience and Technology, Harvard Medical School The goal of this protocol is to outline the collection and processing of human surgical samples for multiple downstream applications in vestibular schwannoma and Schwann cell research. Neonatal Murine Cochlear Explant Technique as an In Vitro Screening Tool in Hearing Research Lukas D. Landegger1,2,3, Sonam Dilwali1,4, Konstantina M. Stankovic1,2,4 1Eaton Peabody Laboratories, Department of Otolaryngology, Massachusetts Eye and Ear, 2Department of Otolaryngology, Harvard Medical School, 3Department of Otolaryngology, Vienna General Hospital, Medical University of Vienna, 4Harvard Program in Speech and Hearing Bioscience and Technology The goal of this protocol is to demonstrate the preparation, culture, treatment, and immunostaining of neonatal murine cochlear explants. 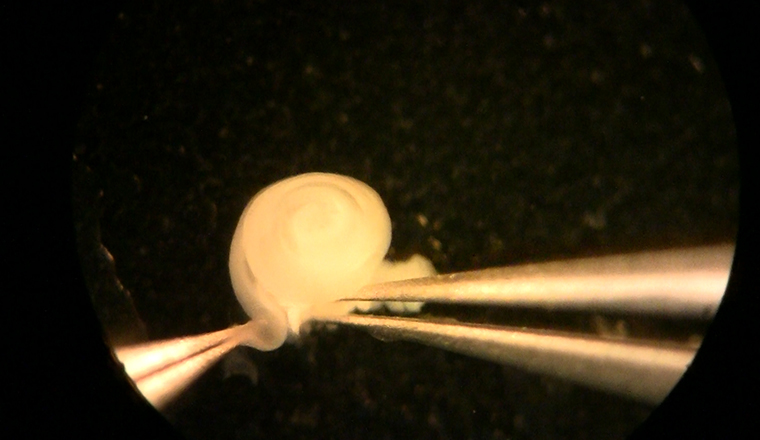 The technique can be utilized as an in vitro screening tool in hearing research. Primary Culture and Plasmid Electroporation of the Murine Organ of Corti. Mark Parker1,2,3, Aurore Brugeaud1,2, Albert S. B. Edge1,2,4 1Department of Otology and Laryngology, Harvard Medical School, 2Eaton-Peabody Laboratory, Massachusetts Eye and Ear Infirmary, 3Department of Communication Sciences and Disorders, Emerson College, 4Program in Speech and Hearing Bioscience and Technology, Division of Health Science and Technology, Harvard This procedure describes a method for the isolation and culture of the murine organ of Corti with or without the spiral limbus and spiral ganglion neurons. We also demonstrate a method for the expression of an exogenous reporter gene in the organ of Corti explant by electroporation.